Katie Cooke suffers with a chronic focal epilepsy and consequently has around fifteen seizures every 24 hours. Whilst this could bring huge limitations to Katie’s quality of life, she keeps moving forward. Katie is a runner and through her love of running she now studies Fitness Instruction at Sallynoggin Community College. She has just received merits and distinctions for year one of her course and completed her Leaving Certificate in 2016. 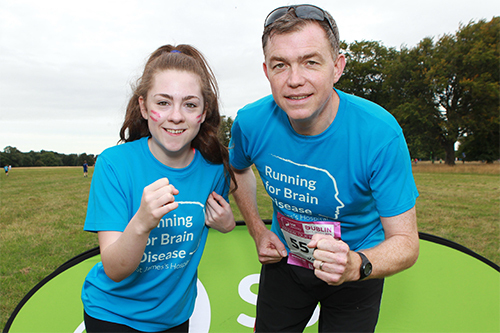 Katie has run a range of the SSE Airtricity Dublin Race Series races over the last two years with her neurologist, Dr Colin Doherty. She experiences multiple seizures throughout the races, but running with Dr Doherty, means that the medical staff at these races, can then allow her to continue to run. In 2015, Katie was the first female in her category (age 18), in just 4 hrs, 11mins and she also experienced 7 convulsive seizures at the roadside at various parts on the route. Dr Doherty can then attend to Katie, but mainly he is managing the mounting concern surrounding her seizures. It is also amazing how many runners will stop and offer to help during the course of a race, even when they are trying to secure their own personal best times. Katie has an almost immediate recovery rate to these kind of seizures (frontal lobe/ focal seizures) and she has always been more than ready to run immediately after, much to the amazement of on-lookers. On November 5th, 2017, Katie and Colin plan to run the TCS New York Marathon together, in their continuing work to raise much needed funds for a dedicated Brain Disease Centre at St. James’s Hospital through the great work of St. James’s Hospital Foundation. 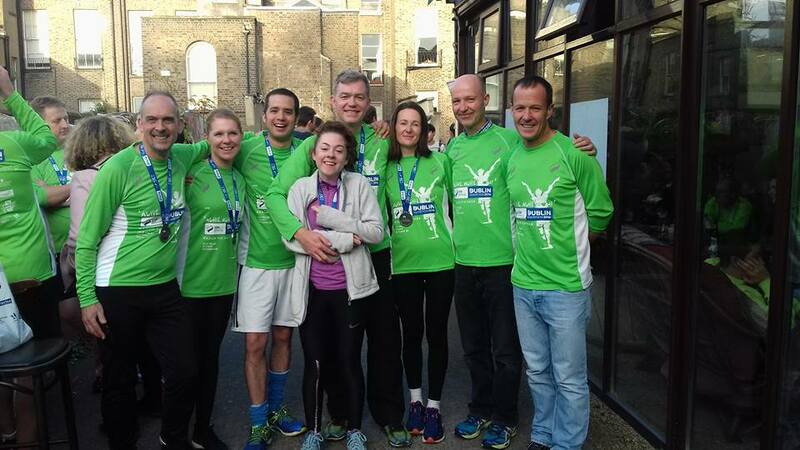 They also will run the SSE Airtricity Dublin Half Marathon in September 2017, with CNN hot on their tails, filming them for a feature on their participation in the New York masrathon. ‘Training this year has been particularly difficult for me, with some of the health issues I have faced since the marathon last year’. ‘When I’m training, I feel my mind and body are in good shape. When I’m sick and unable to train, I can feel myself worsening and it doesn’t take long for a thick weakness and sleepiness to surround my days. I know what it feels like to attend hospital in a wheelchair because I was a wheelchair user five years ago. St. James’s Hospital has been completely understanding about what it is like for me and my family in living with my condition. I would love to see the space at the neurology clinic more geared towards patients who have mobility issues with their brain illness. I would love that my fundraising work will help that to happen. 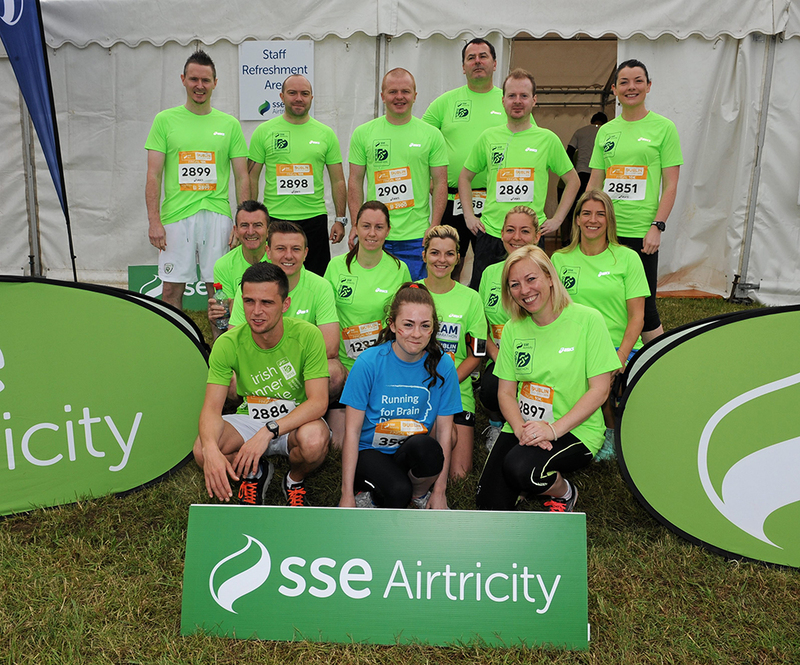 Nicola, Katie’s mum says; ‘In 2015 I sat beside Katie while she cried her heart out in an emergency tent in Swords (at the site of the Fingal 10k race, SSE Dublin Race Series). Her shins were grazed and bloody and she was muck from the knees down. The reason for her being there was because she had experienced a couple of close together seizures (a cluster which was common to your seizures then). She and I had been told that she was unable to continue. As usual, all her vital signs were normal. The reason she was crying was simple; she wanted to finish the race. Not only that, but I knew in my heart that she was able to and there was very little I could do to make it happen for her. How could I possibly convince the paramedics around us that she was able? Her crying and beseeching arguments in that tent still haunts me at times today. Determined not to let this stop her, she trained even harder and told me she was entering the half and full marathon. I thought we were in for a track of intervention and heartbreak and I told her it wasn’t going to work. I worried away at potential solutions until she happened to tell Dr Doherty of what had happened. Being a runner himself and knowing Katie had the correct training to do the race, he offered to run the races with her! Running the marathons has given Katie a working purpose (with her currently being unable to work). I want to support her purpose in any way I can so that she can realise her potential. She trains hard and works hard through this illness when she can. I know how sick her illness can make her, so I’m dedicated to assisting her with finding these balances in life. I also feel that I am now able to give back some support to others with tricky brain illnesses’. Katie and Colin have featured in the following worldwide interviews and continue to attract worldwide attention with CNN following them to Dublin this Autumn for the Dublin Half Marathon. This includes the award winning RTE Radio One documentary (Docs On One) ‘No Time To Lose’, whose producer, Jason Murphy recently won Worlds Best Documentary at the New York Festival awards for it. ‘I’ve always felt really listened to about what my seizures and illness are like by Dr Doherty and his team. I don’t mind going to James’s at all because I know that everyone there tries to understand what it is like to be me. It would be better if we had more space for my visits’ explains Katie. A digital awareness campaign of what it is like to live with a hidden brain illness. Video piece to aid grant securement and advance the Future Neuro programme.